Donate 0.5% of your Amazon purchases at no extra cost to yourself! Where did our funding come from in 17-18? Word of mouth is a wonderful way of getting Manna known. Please tell your family, friends and colleagues about our work, and share this website with them. Please sign up to our mailing list to receive our Newsletter, and encourage your friends to sign up too. Type your email address into the box in the right-hand column of this webpage. We are on Twitter and Facebook. You can see our latest tweets and posts at the foot of the website. Please follow us on Twitter and tweet about us to your followers. Let us and them know about your latest fundraising activities for Manna. And please like us on Facebook and share this website with your friends. 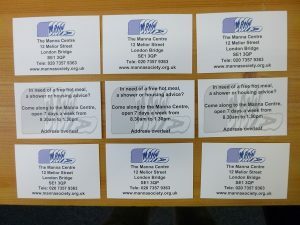 Please help us tell others about our work by distributing our promo tional leaflets. They give a summary of our work and also include a standing order and Gift Aid form. Our Administrator would be happy to send you copies. Please ring 020 7357 9363 or email mail@mannasociety.org.uk giving your name, address and organisation (where appropriate) and how many copies you would like. 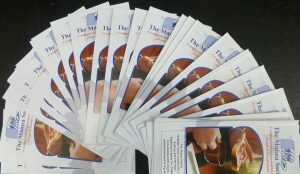 Alternatively, you can download the leaflet as a PDF. 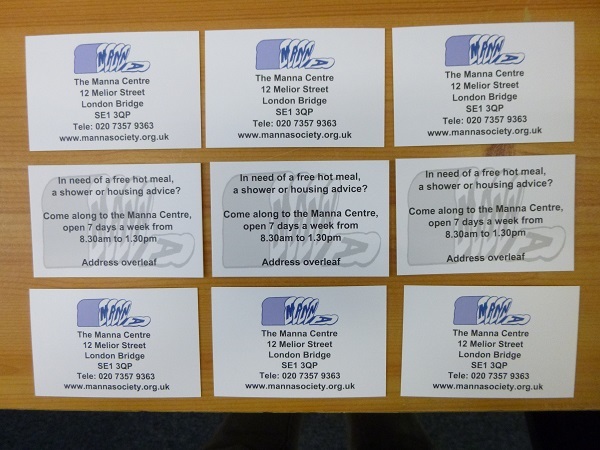 The Manna Centre is open from 8.30am to 1.30pm, seven days a week, 51 weeks a year.